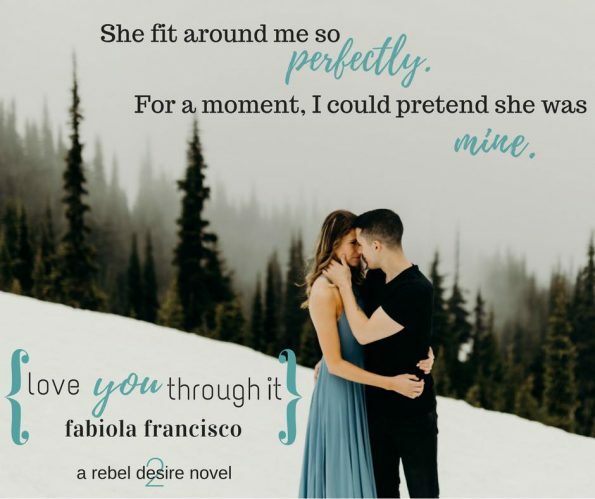 Review – Love You Through It by Fabiola Francisco – 5 Stars!!! Bri is struggling to live, she feels broken, and alone. The person she wants, and needs is gone, never coming back. Each day is becoming harder to get through. Cole can’t stand to watch Bri lose herself, she has so much to give and he wants to help her to survive, to fight, to live. Can Bri open her heart, and let Cole in? Love You Through It, is a heart-breaking story, from the first page I was in floods of tears. My heart just completely broke, I even wondered if I wanted to read on, could I handle the heartache, this story was bound to deliver? And wow Fabiola Francisco, delivered one hell of a story. As you can see I kept reading, and I wasn’t disappointed. This story is not only full of sorrow, its full of hopes, and dreams. Hope that there can be life after you feel broken, that dreams are not completely lost and that sometimes life throws us two wonderful chances at love. I felt such sadness for Bri, I wanted to heal her, find the words to encourage her to fight, to encourage her to keep living. She was stronger than she realised, she hadn’t given in to the pain, she hadn’t succumbed to the darkness, however she was struggling to let people in, and slowly that darkness was beginning to takeover. Cole was amazing, it was clear that for years he had hidden behind an act, not allowing people to truly know the man he was inside; or see the caring, loving heart he had. This story was heart-breaking, and beautiful, in equal measure. Fabiola Francisco wrote a brilliant story, a story I won’t ever forget. You must read this book, just remember to have tissues to hand, you’re going to need them!